The blades used to make recipient sites vary in size according to the size of the graft. The smallest follicular unit, or graft, is the single haired follicular unit. Dr. Keene uses a small flat blade that is between .7 mm-1.5 mm to assure a tighter fit, allowing decreased space between incisions, greater recipient site density, and minimal trauma. 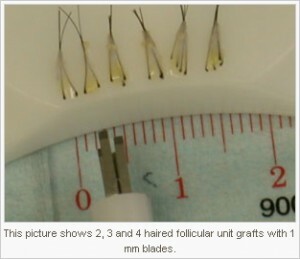 The graft sizes will vary according to the number of hairs in a follicular unit. It is equally important that the incision sizes are not too small, as this can cause a condition called graft compression, which causes the hairs to appear somewhat tufted as they exit the scalp. This is not noticeable in a photograph, but may be on close up inspection of the scalp. Acute exit angles can be achieved with both lateral and longitudinal slits, but smaller blades have made dense packing easier with both. Dr. Keene will determine the best way to achieve a matching exit angle when she sees you. 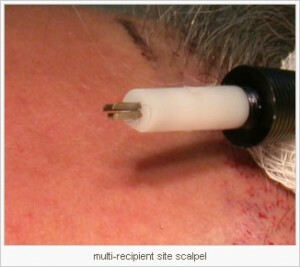 In some areas of the recipient site, Dr. Keene utilizes a multi-recipient site scalpel, which she designed. The instrument allows adjustment in depth to assure that the incision is made to the appropriate depth, in order to minimize trauma that can occur if the incision is made too deep. It also increases efficiency by allowing the surgeon to make more than one incision at once. The blades are deliberately interdigitated to avoid the look of a pattern, while maintaining a predetermined level of density. Precise control over incision depth and density is also enhanced using the multi-recipient scalpel. The doctor chooses which size blades to use based on comparing the graft to the blades. A blade cutter is used to make the blades fit the grafts according to their size. She also uses a single blade to do final stick and place fine tuning.